In the dying days of Melody Maker, I tore one issue to pieces in frustration at the lack of any content worth reading, with the exception of a short interview with Annabel Wright of The Pastels towards the back, which I kept, in which she talked about her connection with Stephen being founded around their being the two ‘committed Swell Maps fans’ in Scotland. Something like that. Now she has illustrated a book of stories by her father about his childhood in a suburb of Birmingham in the 1950s, and I wonder if that background played into her admiration for Swell Maps, who came from Birmingham. In any case, it’s strange (and wonderful) to think of that city having a place in Pastels pre-history, though it makes sense in the light of Wright’s previous city-based artwork. Here, the cranes and riverscapes of Glasgow are replaced by terraces, brickwork, a suburb-centre with a Boots, ’50s cars and buses, Victorian buildings. Some of the drawings use perspective, and are very detailed (like the terraces above); others are more impressionistic (like the graveyard used to play Cowboys and Indians in), or design-oriented (floral aprons are great throughout). There is a river, but it has a concrete bottom, so it’s hardly the Clyde. as his mummy folded his trousers the box of matches dropped out. ‘Where did you get these matches, Robert? You know it is dangerous to play with matches,’ she said sternly. ‘John gave them to me when the den caught fire,’ said Robert. 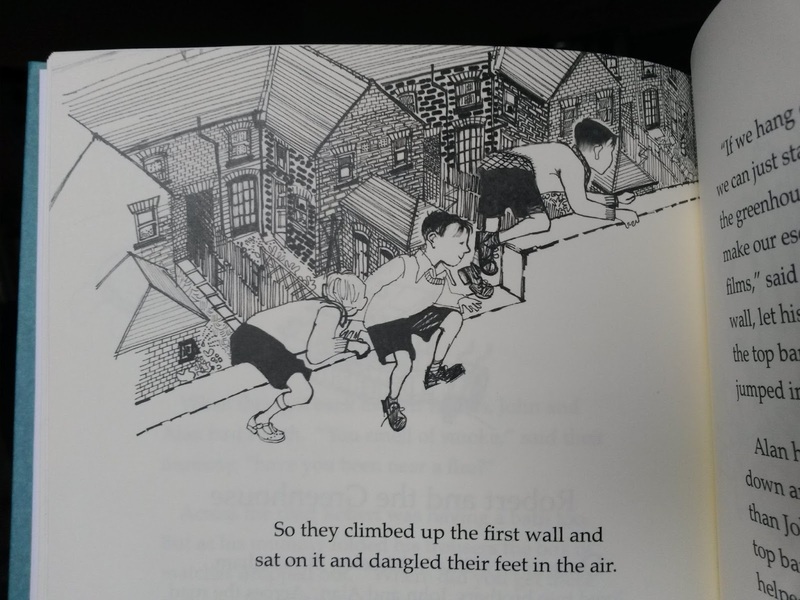 Other chapter titles include ‘Robert and the Apples’, ‘Robert and the Greenhouse’ and ‘Robert and the Gunpowder’. With each one you sort of know what’s going to happen in advance: Robert’s going to get caught stealing apples / breaking glass / blowing something up, and the joy of the stories is in the unexpected way he invariably finds of doing just that. He has an irresistible knack of landing himself in trouble, when it wasn’t his fault, and when it would be the easiest thing in the world simply not to confess, but this never seems to occur to him. Then again, his mother doesn’t enforce her command that he ‘must never play with that John Smith again’, so he doesn’t suffer too much for his honesty. 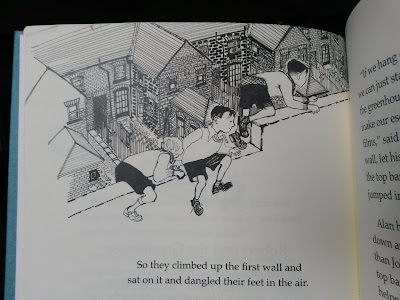 The stories are great to read out loud: I tried them out on S., who loved them (in hysterics within 30 seconds most of the time), and my 3-year-old nephew, with whom I got deep into discussion about why the boys had tucked their jumpers in and filled them full of apples, which tends to be his way of absorbing a story. The sad background (not mentioned in the text) is that John has Motor Neurone Disease, and the book is both a way of preserving his stories, and of raising money for MND Scotland. Available from Monorail. What a lovely review! I just saw it today. It's cheered us all up. Thanks Annabel! We loved the book, as you can probably tell.